What if you lost all of your bitcoins tomorrow? What would you do? In my earlier guide on Bitcoin wallets, I have used two terms extensively- Private Address (or key) and Public Address (or key). These keys are what makes Bitcoin the safest and most widely used cryptocurrency. To understand private keys and public keys, let us look at an example. Consider a mailbox where you receive your physical mail. It has a unique and specific number (an address). If someone has to deliver you a letter, he/she must know your house/flat number to deliver it. And as the receiver, you have a private address (or key) to unlock the mailbox and collect your belongings. In real life, do you give your keys to someone unknown? You always keep track of your key and don’t jeopardize the contents inside of your mailbox. Similarly, just like your house/flat number, anyone in the Bitcoin world can know your public address (Bitcoin address) to send you bitcoins. And to unlock (spend/send) those bitcoins, you would require your private address (or key) for which you need to take full responsibility, just like the keys of the mailbox. I feel that understanding the underlying technical aspect of keys is important so that your remain better informed and educated enough to take care of them. In the next section, I will tell some basic technical aspects of these keys. What is a Private Address (or key)? A private key is a secret, alphanumeric password/number used to spend/send your bitcoins to another Bitcoin address. It is a 256-bit long number which is picked randomly as soon as you make a wallet. The degree of randomness and uniqueness is well defined by cryptographic functions for security purposes. What is a Public Address (or key)? This is another alphanumeric address/number which is derived from private keys only by using cryptographic math functions. It is impossible to reverse engineer and reach the private key from which it was generated. This is the address used to publicly receive bitcoins. This address is always seen and broadcasted for receiving bitcoins. Users can make as many public addresses as they want to receive bitcoins. What are Bitcoin private keys used for? Private keys are used for making irreversible transactions. Yes, irreversible! They are the key to spending and sending your bitcoins to anyone and anywhere. This irreversibility is guaranteed by mathematical signatures which are linked to each transaction whenever we use the private keys to send bitcoins. And for each transaction, these signatures are unique, even though they are generated from the same private keys. This feature makes them impossible to copy. The user can confidently use the same private key again and again. Moreover, the signatures are mathematically related to Bitcoin addresses. 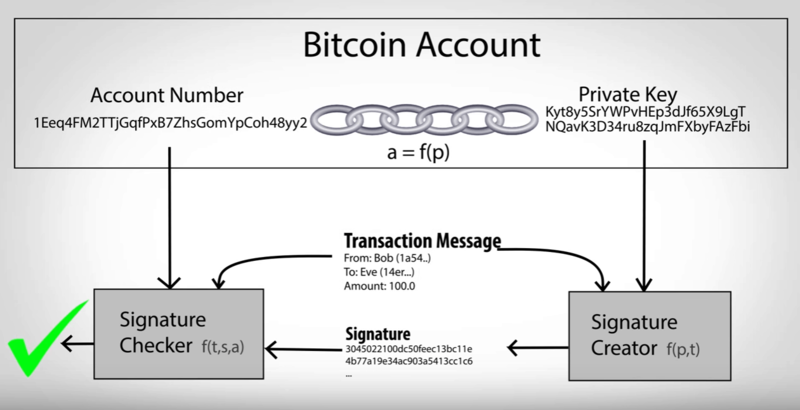 This math relation helps in confirming that the signatures are only of that particular account holder who wants to transfer bitcoins. How do we keep private keys safe? It is OK if you didn’t understand the above technical stuff. You can still use Bitcoin as long as you keep your private keys safe. 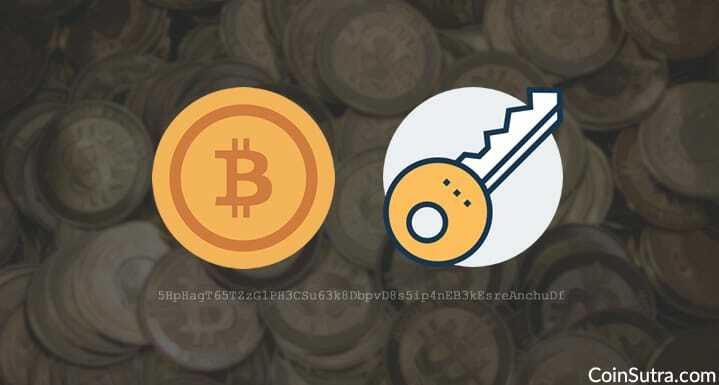 These digital keys are crucial in the ownership of bitcoins. These keys are not stored on the Bitcoin network but are created and stored by the file/software (a.k.a. wallet). A wallet stores these keys. There are a lot of types of wallets out there and some allow the private keys to be stored and guarded by the user. Some keep the key safe on behalf of the user. I have explored each type of safety measure for you so that you can choose the most effective wallet according to your needs. Most of the web and mobile wallet software services in the Bitcoin market store your private key on your behalf on their servers. They get stored in an encrypted form which only you can decrypt. In this kind of wallet, your keys are held by someone else, and if that gets hacked or stolen, your bitcoins are gone. That is why you need to take extra safety measures when dealing with these services. However, there are really great wallets like MyCelium, which I personally use because of its additional security features and compatibility with hardware wallets. Desktop wallets are relatively safe. In such wallets, once you install them on your desktop, you will get your Bitcoin address and private key in a downloadable and importable file. These importable keys can be made password protected and stored on a memory stick or hard drive. But once you lose the file of the private key, you will lose the bitcoins. I am going to discuss each one of these in detail in upcoming articles. Hardware wallets are basically an electronic invention made to store your private keys offline away from the vulnerable online environment so that they can’t be hacked. Some hardware wallets come with security grid cards similar to some debit cards in order to verify the transaction. Some even have a little digital screen to verify your transactions. They are tamper proof and come with a limited user interface. In case your device is destroyed, as long as you have a backup code, you can retrieve your keys and bitcoins. Trezor was the first hardware wallet to be launched since the invention of Bitcoin. It is a small device which can be connected via a USB cable to your personal computer. Its fundamental purpose is to store the private keys offline and sign transactions. 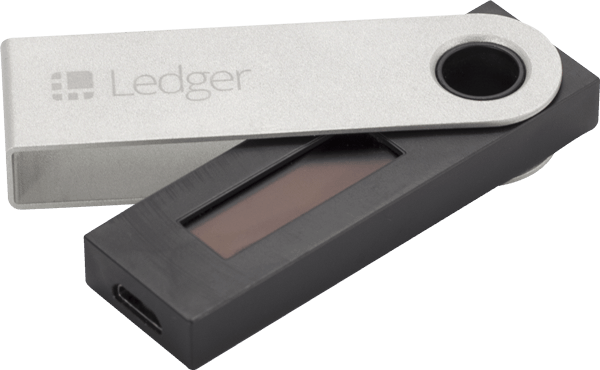 Ledger Nano S can be used even on a computer that is infected with malware. It has two buttons which are needed to be pressed together to sign and confirm a transaction, making impossible for a hacker to use. Ledger Nano S also requires the user to create a PIN code on setup. 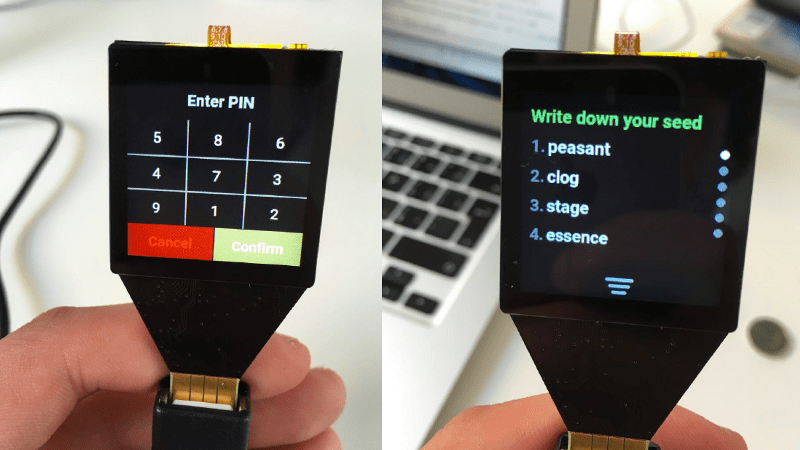 The PIN code helps prevent the loss of bitcoins in case your Nano S gets lost. 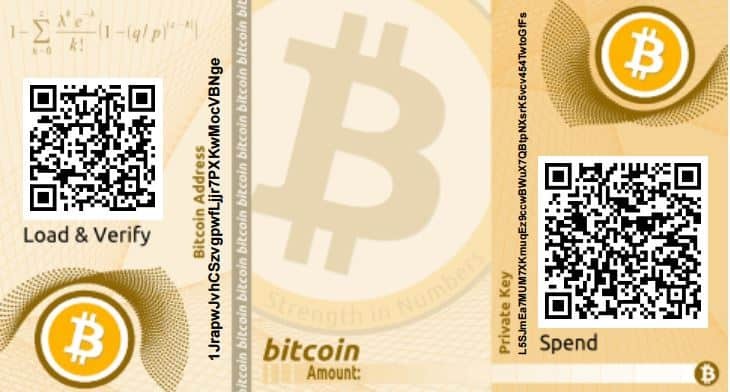 Paper wallets are simply Bitcoin private keys printed on a piece of paper. It can have the Bitcoin public address also printed on it, but not necessarily. Paper wallets are an effective way of storing Bitcoin private keys offline. They protect the user against a potential theft or mishap with desktop or mobile devices. These kinds of wallets are also called “cold storage” because the keys are generated offline and never stored online or on a computer. You can make your paper wallet from bitaddress.org, which is an HTML page specifically for this purpose only. You can save the HTML page offline and remain disconnected from the internet to generate the keys. They can be printed on paper or stored as a soft copy on a USB or hard drive. Read my previous guide on how to make a Bitcoin paper wallet. In a Bitcoin wallet, the most important thing is your private key because it will prove that the bitcoins you claim as your own are actually yours. In upcoming posts, I will cover how to set up a wallet for each type (Mobile/Desktop/Hardware/Paper) and how to save/import your private keys. How are you keeping your private keys safe? Let us know what you do in the comments below!! Have a question about Bitcoin Private keys? Feel free to ask in the comment section below. Happy reading, learning, and sharing with the CoinSutra Community! 1 What is a Private Address (or key)? 2 What is a Public Address (or key)? 2.1 What are Bitcoin private keys used for? I’m trying to understand who owns a bitcoin’s private key when the bitcoin is owned by multiple “investors.” Like if I buy a tenth of a coin, do I get the private key? If not, what good is it? If so, what’s stopping me from spending the whole coin? You can buy Bitcoins in fractions up to 8 decimal places and you own keys of whatever you buy, you are not at the risk of other fractions…it is not a whole number key or key of traditional look you are assuming to be. where would I then find this key? In the wallet, while you set it up for the first time. hello Sudhir, thank you for your valuable articles. today I am looking for a trusted btc miner to recoup some coins that i sent from my trezor wallet to a bch address (also generated from my trezor wallet). I am a total newbie and a bit confused. i can see the transaction on the blockchain when I enter the private address, but I do not know how to get the btc back into my trezor wallet. the coins have not been spent yet. i am willing to pay for the services of someone who can help me get the coins back. the amount is not a lot but for me it is critical. You have sent BTC to BCH address is this the issue? Not quite able to understand your situation. I’ve read there’s theoretically no limit to how small a bitcoin can be divided. But, okay, suppose I buy a hundred/billionth of a bitcoin (smallest current unit), and you own the rest of it. Are you saying I get my own private part of a public/private ECDH key pair that is different from yours? I’m still confused. It will be different keys for everyone hold different parts/fractions of BTC. Thank you, Sudhir. So even just to buy 1/100,000,000th of a bitcoin you get your own set of ECDH keys. Must be a nightmare for the network. Is this where “dust” (denial of service) attacks originate? If I buy 1,000,000 Satoshi all from different sellers, do I then need to keep track of a million keys, or can I combine them into 1/100th of a bitcoin under a single key pair? Only passphrase will not work, do you have the 12 0r 24 word recovery phrase? i have a address. how can i found the private key of that address ? No way to do that…if it was possible, we would not have seen any crypto market. Actually, it is possible. Like all asymmetric encryption, the ECDH problem can be solved. Given current hardware, it’s still hard. But there are weaker curves. And there are mathematical approaches. One could also get (very) lucky. Also, quantum computing is expected to render elliptic curve encryption obsolete. I also wonder how long until the big bitcoin miners switch from trying to solve the double SHA256 hash to attacking known public keys. Yeah, I know that but so far not, so enjoy and live the day. Why don’t people make multiple backups of their wallet.dat file? Not if they do what I do. I have removed the file from my computer and have numerous copies on SD cards and burnt to DVD’s. About 10 copies in total. If I were to ever “invest” in bitcoin, I’d encrypt my wallet.dat file (probably under rijndael) and store it in multiple locations, including a public cloud like gmail’s. You can encrypt in the wallet and a public store can be hacked. No way to decrypt an encrypted wallet.dat file. Not with the strength of modern symmetric methods: e.g. blowfish, rijndael, serpent, etc. Unless you know the key. Look at the lockee virus. I’d probably put all my wallets in one big encrypted file/archive. It’d be perfectly safe in anyone’s hands. You could store it anywhere. If i buy bitcoin on Coinbase or Zebpay, do I not have a private key until i transfer it to my hardware wallet. In other words i bought and set up a Nano S, did the Nano create my private key for me and before that I did not have one? Or does the Nano just protecy my private key. How was I able to send BTC before setting up my nano? Coinbase & Zebpay means you don’t have your keys simple. thanks this is a very good article, can i request coinbase to share my private key? They don’t share private keys. Yes, private keys are the only thing that matters. Sometimes you also get seed words or keys that are also used to generate private keys only. As, long as you have the keys, no matter what happens to your device, you can always recover your cryptos via a compatible software by re-installing everything. if i have the private key but forget the corresponding public key , i can just regenerate the public key and access to the coin right? My question is, if we import the private keys can i then transfer that particular bitcoin’s to other person or sell it. 2. The bitcoins which i transferred to Bittrex or Poloniex can i get/extract the private keys of that too. i see that in the above you mentioned : The user can confidently use the same private key again and again. i thought every private key has exactly one corresponding public key, and every public key has one address. How can you use that again and again? ( from coinbase to my wallet), there will be a pair of public and private key generated , i will get the private key form the wallet to unlock the bitcoin? say after that i plan to transfer another quantity of bitcoin to another user, i know the user’s public address (key) , with the public key i generate another private key for the another user to unlock the bitcoin? your Public Key is your address of your Wallet… wether it’s on coinbase or a wallet on your PC or Smartphone. if i bought btc in coinbase and i transfer the bitcoin into another wallet ( 1 transaction), in this transaction( from coinbase to my wallet), there will be a pair of public and private key generated , i will get the private key form the wallet to unlock the bitcoin? after that i plan to transfer another quantity of bitcoin to another user, i know the user’s public address (key) , with the public key i generate another private key for the another user to unlock the bitcoin? remember… a Private key is a one time creation for the generation of the Public Key… and then, that private Key is for the owner of the wallet ONLY. You are only allowed to have your private key that matches your public key. i also see that you use public address and public key interchangeably, however they are different as a bitcoin wallet address is a hashed version of your public key, is it correct? 1) only the receiver of btc creates public address, then it will generate a pair of keys ( public and private ) , the sender of btc will use the private key to access the btc given in previous transaction and send to the address of the receivers , is it correct? 2) if i buy bitcoin in piece in multiple times ( for example each time i buy 0.2 btc for 5 times, i end up having 1 bitcoin), do i have 5 private keys? if i were to send out 1 bitcoin to another address , do i have to send 5 times? 3) if a donation account ( a static account) has only one public address asking for multiple senders to send to that address, and people donate to that, the person can access all the BTC sent to that static public address with one private keys? 1) Not able to understand what you are asking? BTC address can be generated by receiver and sender both. And they hold their respective keys related to their addresses. BTC just moves from one public address to another. 2) If you send 0.2 again and again to the same address then you have one single key and if you send it to 5 different address you will have multiple keys. 3) Yes, you are right. I heard that obtaining the private key means taking ownership of the bitcoins. How to do this practically? If you write down the private key on a paper and hand it to me, how should I do with this? and if more than 1 person get this paper at the same time who would be the owner? Put these keys in a wallet to claim your btc. Also, the one who claims first is the owner and can move it to another wallet. Thank you for quick answering. Seems I couldn’t find a way to “put these keys in a wallet”. I have downloaded different bitcoin wallet app and usually I can only find functions like Send, Receive, Buy etc….and for “Receive” it is only about sending the public key to someone else. your explanation of the asymmetric encryption method that allows users to verify ownership actually isn’t at all technical, but purely metaphorical. One would have to study and understand elliptic curve theory and math to appreciate the difficulty of the problem someone wanting to steal your bitcoin would need to solve. Other cryptocurrencies use elliptic curve, too, which has been around about 30 years now. (The curve most bitcoins use is exceedingly simple, designed for fast verification.) Also, cryptocurrencies have zero intrinsic value as an investment, and so rely strictly and totally on what’s called a “greater fool” strategy. I have a paper wallet, which I photocopied as a backup, the lost the original. The photocopy QR code for private key was wrinkled and didn’t scan, so utilized the alpha numeric key. Had trouble getting the alpha numeric key to take in blockhain.org wallet, then got it to be accepted in another wallet, which it has been pending for 4 days now. How would I know if the alpha numeric code was accurate? Would it reject the code immediately if it wasn’t accurate? If it wasn’t accurate it will reject automatically. Moreover, there are several formats of the private keys so which one are you using I don’t know. Some more inputs like formats will help in analyzing. But, my friend, the best thing you can do is note it on paper, have a notebook for this only. Private keys must be kept offline, and out of your computer. I have a money coming to me for investments. They put it in my account but I can do anything with the it. Then it disappears. They told me I need to buy a private key in order to receive the money. Is that true and how do I get one so I can receive the money. They told me it would cost $2000 for one. Probably someone is scamming you. Private keys are not bought and sold. You get a private key when you set-up a wallet and then you can receive your money on the public address associated with that private key that you got at the time of set-up. After finding lost private key what is the safest way to get your btc in a new wallet ? Import or Sweep it Coinomi Wallet in a valid key format and you will be able to claim your BTC. This would also work if you cracked any coin’s ECDH problem. The coin would become yours. From where you imported? Paper wallet or something else you used for the import? The more I read here, the more I wonder about cryptos. If there were a way to figure out a private key from the public address, I’d spend every bitcoin out there. But which brings to mind a question I’ve been mulling over. Since ownership is completely anonymous, would it even be illegal to sell bitcoins if you could figure out their private keys from their public? I’m thinking not. SUDHIR KHATWANI can i please have your email address. Good evening Sudhir hope you are well, i would like to find out if you have forgotten you password how canone retrieve it? Which password are you talking about? DO you want to recover the keys or seed? Some 1 put his btc at watch in my account and said he send the btc to me what can I do to the btc without a key cause he is refusing with it cause I payed him. Hello there.. i want to ask if the watch only bitcoin they send in my imported address wallet can be withdrawn or remove there without logging in my wallet if they have the private keys? With private keys you can take any BTC without login. If I didn’t have a scanner for that grid you get when making a paper wallet, is it ok as long as you just have the private and public keys or could I take a photo of it ? Yeah but photo might be risky. I want to get into crypto currency but I haven’t much money to start could I start with 2 Litecoin and trade with that ? Or wouldn’t they expect such a low amount. You can begin with any amount on Binance or Bittrex like exchanges. Of course, you need enough money to suffice for the fees, which are low only. Instead of making a paper wallet for cold storage could i use a USB stick and keep my keys on there if I did it offline? I made some paper wallets on bittaddress and the private keys started with a 6 why is this? Make hard copies and keep it in a safe. Hi Sudhir, great article thank you. I had my bitcoin in a Multibit wallet and this is no longer supported. I’ve been able to export my private key next, but I’m wondering what to do next to import it somewhere useable (such as Blockchain). Do you have any suggestions on what I should do next? @Quaetapo Thats right. You can import it to Blockchain or any other wallet that supports importing of the private key. Since proof-of-work difficulty is set so that one blockchain block is mined only every ten minutes, and a block can only hold 2000 transactions, doesn’t this limit the network to about 4 transactions per second? Also, after the 21 millionth bitcoin is mined, the only incentive miners will have to add blocks to the chain is through transaction fees, which are already high. Not clear how bitcoin has a future?